Now that I am one week into the Olympic Games in London, one thing is definitely apparent, and that is how dependent I am on the latest technology to help me be as productive as possible. Since so many of the blog readers have asked questions about this, I thought that I would share my experiences with you all. Lets start with the camera gear. For this Olympics I using 2 of the new Canon 1DX cameras and they are amazing. Yes, they shoot at a very high rate of speed, but we were shooting at 12 frames per second at the last couple of Olympics. Nothing too new here. But, what is different is the way that I can capture images at ISO 3200 or ISO 4000 and not even need to run any noise reduction software on the images before posting them. That is a huge time saver. The other advantage of these newer cameras is that they are UDMA7 enabled, which means that they can transfer images from the camera buffer to my memory cards really fast. This year I am armed with the new Lexar 1000x Professional Compact Flash cards which scream. No more waiting for the camera while the action is happening in front of me. And, unlike most photographers here at the Games, I shoot everything in full sized RAW files. Why? Because I am using 128GB 1000x CF cards. Why would I not want to shoot the best quality images possible if I have the space? (I will talk about the hard drive space in a little bit). Still talking about the capturing process, lets talk about the lenses. As I mentioned in a previous post, the new Canon 200-400 lens is a game changer in my eyes. This lens is so versatile that I can get my tight shots and wide shots without having to switch lenses and cameras. This also saves me carrying additional lenses which is critical when you are moving as much as we are here in London. Thank god for my LowePro Pro Roller x200 bag. My body would be wrecked already if it was not for this bag! No lets talk about the most critical piece of my daily workflow at the Olympics, downloading, editing, retouching, and posting the images. I am using the new MacBook Pro with Retina display. The best part of this new Mac is not the display (although I do like it), it is the new USB 3.0 ports. This lets me connect my Lexar Pro USB 3.0 readers and download at 15GB per minute. That is truly awesome!!! Being that I have already captured more than 400GB of images in the last 6 days, this alone has saved me so much time, and saved me stressing out compared to the last Olympics. Remember, I have to download all the images from the event, go through them, delete the rejects, pick the best ones, edit and crop them, all within one hour! Oh, I almost forgot the other key feature of the new laptop, it has an SSD drive. No more latency of a platter hard drive. Solid state is the only way to go! The only drawback of the SSD is that I am limited to 512GB of space. That just does not cut it when you shoot as much I am right now. So, in order to solve that issue, I have brought along 4 of the 2TB Western Digital USB 3.0 Passport drives. I am using two of them to backup all of the images (one carrying with me and one at the apartment) and the other two for daily backups of work in progress. Again, the USB 3.0 speed has been a game changer. Tiny little drives that are easy to carry and so fast! I can now backup data in 30 minutes that used to take hours. There have been a couple of nights when all of this technology has been the difference of 4 hours sleep and 6 hours sleep. Trust me, not only do I need to charge camera batteries, but I need to recharge myself too. People always ask me if I use Aperture or Lightroom for my editing. The answer is neither. They are just too slow for me. Myself and just about every other photographer here at the Olympics, use a program called Photo Mechanic 5 by Camera Bits. They application is lightning fast for going through my images. It does do all that fancy retouching that the other applications do, but it is perfect for going through hundreds or thousands of images and finding the "money shots". I mentioned that I am one of the few shooters here that captures RAW files. I am also the only photographer that I have seen who travels with my Wacom tablets. If you use one of these babies, you know why I do this. Another huge time saver as I can retouch images at lightning speed. 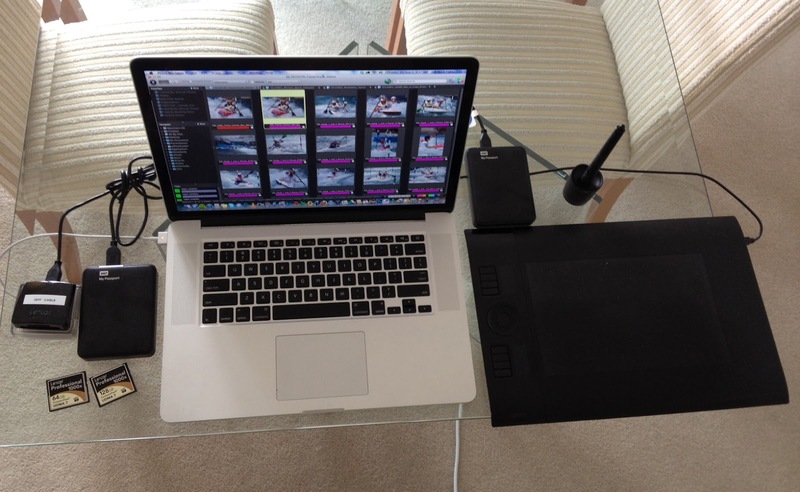 I actually brought two of the Intuos5 tablets here to London. The larger size tablet is at my apartment, and the smaller size tablet is in my locker at the Water Polo venue. Now, that is efficient! This Olympics is the first time where my iPhone has become my trusted event guide. There is an app called London 2012 and it shows me what events are happening each day. I made a plan of action before I left America, but this always changes once I get to the Games. I wake up each morning and consult the London 2012 app to make sure that I am hitting the best events. I can not imagine going to another Olympic Games without this type of tool. It sounds really weird, but when shooting this many sporting events in a two week period, it is imperative to make the most use of every minute. This is probably the only time where I eat to live, as opposed to living to eat. Normally I like to sit down and enjoy a good meal. Not here. Meals take away from productive time. Seriously, all of this new technology has been nothing short of amazing! Well, enough of this writing, I have images to capture and edit, and other blogs to post. Thanks so much for your extremely informative blog here on your photographic experience here at the Olympics. I really can't believe there are no comments about this blog post, as this is by far my favorite you've posted so far, and I've read all your 2012 Olympics posts. Guess that's because I'm a wildlife photographer that can't wait for much of this equipment to come out that you're using. I'm very interested to know any further thoughts you might have on the Canon 200-400 f/4L IS w/1.4x. There has been a lot of speculation about how large this lens is. Would you compare it in size and weight to the Nikon 200-400? Or is it closer in size and weight to the Canon 300 f/2.8 IS versions I or II? Or closer in size and weight to the 500 f/4 IS versions I or II? Is there any way to weigh and measure this thing in all your down time? ;) Is it well balanced? How would you rate the sharpness compared to Canon's other Super Telephotos (both versions I and II)? Do you notice the typical amount of image degradation using the built in 1.4x extender that you would get with a 1.4x III? Or does it seem sharper than you would expect from an add on 1.4x and more optimized for the 200-400 as many have suspected? Thanks again for your very informative blog posts. Very interesting to read! Excellent blogpost, Jeff. Very informative. Curious as to how you hook up your USB 3.0 card reader, and two separate USB 3.0 external hard drives, and your Wacom, when the MacBook Pro only has two USB 3.0 ports. Do you use some sort of USB 3.0 hub? Or how do you have everything you show in the picture of your computer hooked up to this computer? I did not have all of the SB 3.0 devices hooked up at one time. When downloading, I would connect the readers. Then after that, I would connect the Wacom tablet to edit. Finally I would connect one USB 3.0 WD hard drive. Later in the week I would connect 2 hard drives and duplicate the latest one. 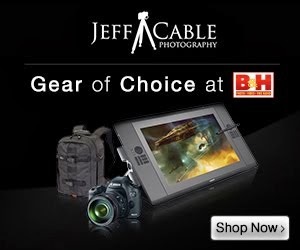 Jeff, interesting workflow. Are you saying that you had two Lexar USB 3.0 Card Readers (you just mentioned one in the article and I could only see one in the photo) hooked up to your MacBook Pro when you were downloading? Would this allow you to download two CF cards at the same time? Or why did you have this setup? Or am I misreading this? If you can download two CF Cards on separate CF Card Readers at the same time, that would be something I had never heard of or even thought of. Would running two cards be faster than running one card at a time, or can the USB 3.0 and the computer handle this much download size of images? Please clarify, as I'm looking into getting the same setup to download my CF cards you talk about here, and want to see the possibilities. Thanks so much for the helpful info. P.S. Is there anything you can say in answer to my question above from August 7th regarding the 200-400? I know you may be sworn to secrecy about it, so if you can't say any more, then don't worry about it. But if you can answer some or all of my questions, I would greatly appreciate it. Sorry - just so busy that it is hard to keep up. The 200-400 is pretty reasonable is both size and weight. Less weight than the 400mm 2.8 I think. The sharpness looked really good, but these are hand built prototypes. I would like to play with the real thing before making any final comment. I did not see any major degradation with the 1.4 switched. It was really awesome to have an effective focal range of 200-560mm. As for your other question, I do, at times, connect both USB 3.0 readers to my new Mac at the same time. And yes, the bandwidth does allow for increased speed. I was downloading 15GB a minute when using both at one time!!!! That was awesome!